It is something of a cliche that women tend to complain about the challenges of finding clothing that not only fits them but adheres to their impeccable tastes and flatters their form. No one needs to hear yet another lengthy rant about that which we hold to be true. I take this as a given. Instead, I wish to take a moment to mourn the near extinction of jeans made with actual denim. It has not escaped my notice that the supplies of jeans have been infested with a strain of virulent, genetically-inferior forms, innocuously labeled “stretch” denim. It has some admirable qualities. It is comfortable, and more flexible than true denim; it conforms to diverse forms more easily, and moves with the wearer in a superhero-sort of fashion. But, when I plunk down $150 for a pair of jeans (which, for the record, I won’t do, because, frankly, I’m cheap thrifty never going to think that’s a reasonable amount of money to spend on jeans. However, let’s say I took a temporary leave of absence from my sanity, and had $150 in mad money to spend on a pair of jeans. Having spent this amount, I’d still expect to be able to wear them more than three times. The likelihood that I would be able to wear them more than three times is miniscule if they happened to be made of “stretch” denim. It’s worse if I decided I might like to wash them. By my (only slightly) exaggerated estimate, I could get at most two wearings if the washer got involved. And here’s where I get positively old-fashioned. I have never seen denim jeans disintegrate before, but, once infused with the evil taint of “stretchiness,” they can’t seem to handle their own rivets. If you happen to brush against a pine tree, you’re liable to have an embarrassing wardrobe malfunction. Levi Strauss would never have become a household name if his work pants had had the tensile strength of starched tissue paper, but that has become the new norm. Frankly, I just want my jeans to be jeans. But, they’ve become an endangered species. While my keen denim senses can tell the good stuff from the inferior stuff from 50 paces, I am increasingly disappointed that you can’t just walk into any shop and leave with a satisfactory denim garment. The typical shops are more keen on selling jeans as items of fashion then as objects of utility. My quest for stretch-free denim has led me to some desperate measures. I’m not yet guilty of invocating dark powers to cleanse the “stretch” from the face of denim-kind, but, I might’ve been seen looking through the denim selections in somewhat unorthodox places. 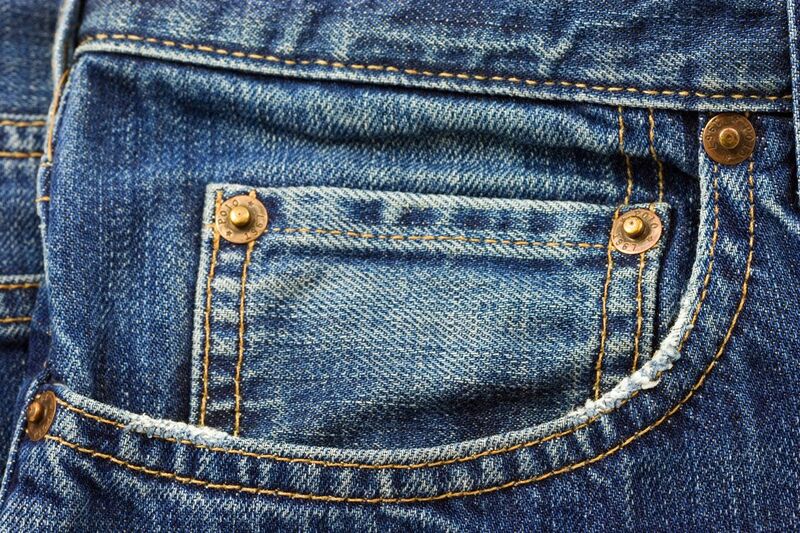 I hesitate to say more, lest the supplies be further depleted, but, suffice it to say, I’ve determined what my inseam measurement is.